This great optical illusion has been all over the internet over the past day, but in most cases people are asking the wrong questions about it. What's interesting is not whether you see a white dress with gold bands or a blue dress with black bands—it can appear either way to most of us. If you haven't seen both color versions of the same photo, keep checking back at the image, it's amazing to see the shift once it happens, and well worth the effort. I've been working with color professionally for nearly 30 years, and this is the first time I've been confronted with this illusion. So what's going on here? During infancy our brains learn how to make sense of the confusing signals picked up by our senses, including sight. The wavelengths of light that enter our pupils are affected by many things, and don't necessarily represent the actual hue of an object very accurately. For example, the light bouncing off of a bird in a leafy tree will be tinted green by having also been bounced off of leaves. This is particularly easy to see with white objects. A white bird in that tree will appear quite green, although we will understand upon seeing it that it's actually white. Over the years, people have come to understand the way the brain interprets true colors from the false signals it's presented with, and codified it in the system of color theory. One of the principles of color theory is the phenomenon of "simultaneous contrast," where one color seems to push an adjacent color towards its complement, or inverse color (blue, for instance, gives adjacent colors an orange tint and vice-versa). A well-known example of this principle happens when you stare at a red dot for a minute or two, then transfer your gaze to a white wall...a green dot seems to appear, the complementary of red. 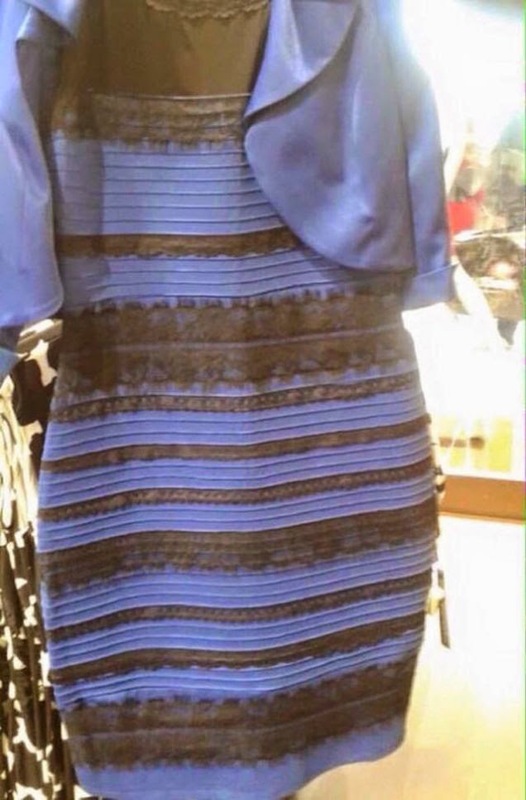 The actual dress is blue with black bands, and these pigments are represented in the photo in question with various shades of two complementary colors: a purplish-blue-gray and greenish-golden-brown (above). The primary colors of light (blue, red and green) are different from those of pigment (blue, red and yellow), so pairs of complementary colors on a computer monitor differ somewhat from those on a painting; this illusion would not work with a printed version of the photo. 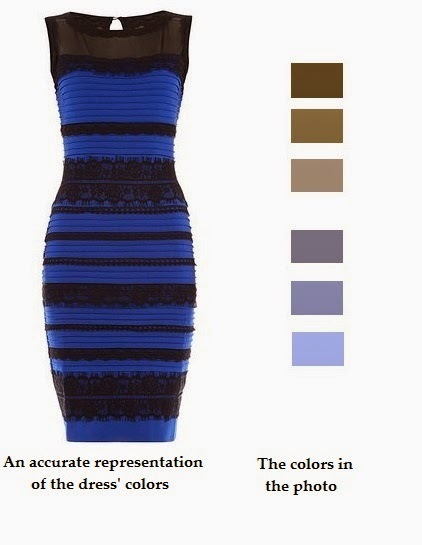 The brain can translate the gold-brown and blue-gray bands correctly as the black and blue of the real dress. In that case, simultaneous contrast makes the blue look deeper than the actual colors in the photo. The brain can also assume the purplish-blue is color being reflected off of a white surface. This color, a sort of dirty light ultramarine, is very commonly reflected off of white surfaces that aren't illuminated brightly, which is probably why the the brain is so quick to make this mistake. In this case, it presumes that blue gray is really white, and that the golden-brown hues represent actual pigment, and simultaneous contrast intensifies them to make gold. That's basically what's happening here, but it doesn't explain why the two colors don't enhance each other. Normally, when you set two complementary colors like these next to one another they exaggerate each other's brilliance, but in this case our brain seems to know that the colors in one set of bands are real and those in the other set illusory, because only one color or the other pushes the hue of its complementary bands to a more extreme version of itself. This is the strangest part of this illusion, and the one that's hardest for me to explain. It probably involves some assumptions our brain makes based on what we know about dresses and shapes, but more than anything, I think there's an odd (and unknown to me) principle of color theory of light that doesn't apply to pigment at work. I'm interested to hear any explanations you might have. HAPPY BIRTHDAY, KOMODO NATIONAL PARK! DO WE REALLY WANT REGULATIONS CUT?